legacycentral bbs • View topic - Is this a normal cam seal failure? Is this a normal cam seal failure? Post subject: Is this a normal cam seal failure? This is what I found chasing down a profuse oil leak originating from my timing cover. Something tells me some oil may have been seeping out of there But seriously is that normal seal failure or should I be worried about crankcase pressure or some other issue? 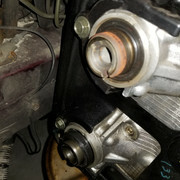 Post subject: Re: Is this a normal cam seal failure? Whoa has the seal backed all the way out? Yup. Just hanging out loose on the end of the cam. I would have expected this due to age if they were original pieces, but these were new OEM seals installed about 4 years ago. The seal itself looks fine. Not torn, chewed, disintegrated, etc. Looks like it could be pressed back in and go another few years (Ive got new ones onhand of course). In the process of replacing the rest of the seals, I found both my RH/Driver's side seals are backed out several mm. Not enough to leak noticeably, but if I had decided to just keep adding oil and hold off on finding my leak I could have had a big mess on my hands down the road if the other two popped out was well. Maybe I just didn't seat them properly when I initially installed them? Im sure I did it right last time but I can't think of why else they'd work themselves out like that. I'm pretty sure their typical service life is way more than 4 years.